Mustafa Bozdemir, 50, was bequeathed a house in Melikgazi five years ago and decided to carry out restoration work. He explained that what he thought was a single-storey house, turned out to have multiple levels of ancient rooms beneath it. “We also found some remains during the cleaning works such as human bones. They were examined by a team from Erciyes University,” said Bozdemir. “We thought that there might be storage space for food or a stable beneath the house. But had no idea that it was part of an underground city. The underground city that we found by accident during restoration begins a few meters under the ground and has two levels. There are parts resembling underground remains of settlements in Cappadocia. Wonderful structures emerged everywhere, like an iron workshop and a loft. The newly-discovered underground structure in Melikgazi has been compared to Cappadocia (pictured) where hundreds of subterranean structures have been found. Photo credit: Wikimedia. Bozdemir immediately notified the Kayseri Governor’s Office and the Culture and Tourism Directorate, who examined the site and gave permission to continue excavations to completely unearth the underground city. They have also contributed the equivalent of $420,000 towards the restoration. 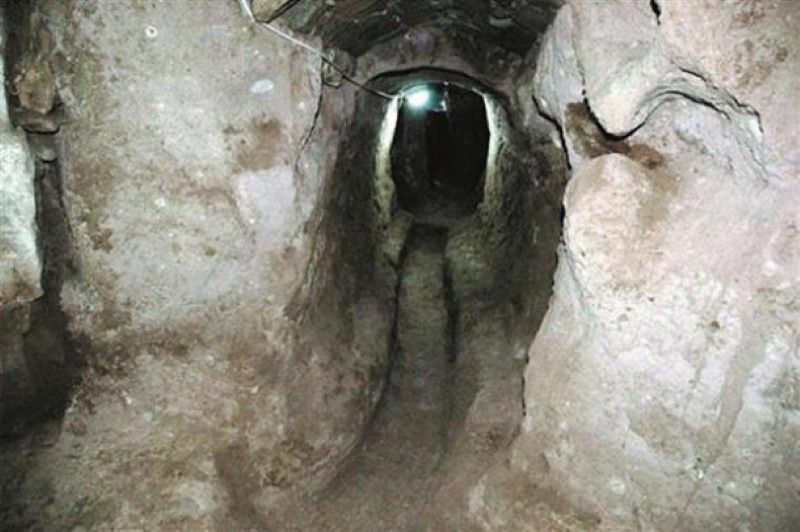 “We think that the underground city was active in the Roman, Byzantine and Seljuk eras and other stone buildings there were built in the Ottoman and Republican periods,” the local mayor Mehmet Osmanbasoglu told Zaman Online. So far more than a hundred truck-loads of soil have been removed from the underground structure, revealing multiple rooms across several levels. It is believed that around eighty percent of the subterranean city has been uncovered so far. Osmanbasoglu said he hopes excavations will find the underground city is linked with the neighbouring towns of Turan, Gesi and Zincidere. The region of Anatolia in Turkey is known to have the most spectacular underground networks in the world. One of the most magnificent subterranean cities is Derinkuyu, which is eleven levels deep, has 600 entrances, consists of many miles of tunnels connecting it to other underground cities, and can accommodate thousands of people. It is truly an underground city, with areas for sleeping, stables for livestock, wells, water tanks, pits for cooking, ventilation shafts, communal rooms, bathrooms, and tombs. While the latest discovery in Melikgazi is unlikely to be as spectacular as Derinkuyu, it is nevertheless an extremely significant finding, demonstrating that the underground world of Anatolia has not yet given up all its secrets.